Cutrine-Plus Algaecide is one of the most popular algaecides on the market today. It is a double-chelated copper solution effective against a wide variety of algal species. Due to its double-chelate it stays in the water column longer, and in combination with its greater amount of activity in the plant can be much more effective. Planktonic (suspended) forms such as the Cyanobacteria (Microcystis, Anabaena & Aphanizomenon), Green algae (Raphidocelis & Cosmarium) Golden algae (Prymnesium parvum) and diatoms (Navicula & Fragilaria); Filamentous (mat-forming) forms such as the Green Algae (Spirogyra, Cladophora, Ulothrix & Rhizoclonium) and Benthic (bottom-growing) forms such as Chara and Nitella. 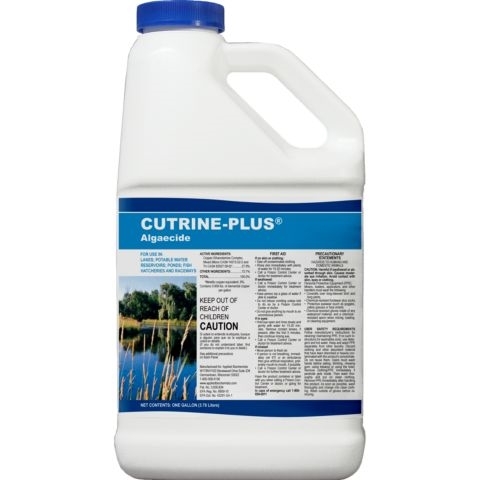 Cutrine-Plus Algaecide has also been proven effective in controlling the rooted aquatic plant, Hydrilla verticillata. Waters treated with This product may be used for swimming, fishing, further potable water treatment, livestock watering or irrigating turf, ornamental plants or crops after treatment. The only chelated copper algaecide that is patented on the market today! Sold Individually, Case Qty. = 4 x 1 Gal.